Raw Uncut Vinyl for Windshield Strips, or Custom Use. LARGEST selection of awesome high gloss or matte vinyl colors! 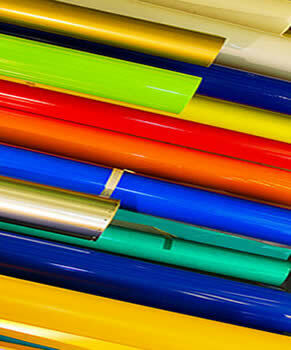 Neons, Flourescents, Metallics, and our most popular standard 6-year durable vinyl colors. Easy to apply. Wet of dry application possible with most vinyls. See our application instructions and videos. Many, many uses. Hotrod, Racecar, Car Club, Teams--Be creative! BEST PRICE for 6-year vinyl in small or large quantity. Ships 5 days a week. Choose a vinyl color and vinyl size to get a price. Choose the size for your vinyl sheet material. White Vinyl Decal Material: The Most POPULAR COLOR for glass, tinted windows, and dark color surfaces. Beige Vinyl Decal Material: There is currently no description for this Beige vinyl sticker material. Bright Yellow Vinyl Decal Material: Very bright yellow. Up there with the popular colors. Pink Vinyl Decal Material: Light Pink or Magenta color. Oracal 651 Series 045 Intermediate Vinyl. Up to 6 Years Outdoor. Orange Vinyl Decal Material: Regular bright orange. Burnt Orange Vinyl Decal Material: Also known as terra cotta or nut brown. Similar to the University of Texas Longhorns color. Bright Red Vinyl Decal Material: Very POPULAR. Bright red like a Fire Engine! aka standard RED. Black Vinyl Decal Material: POPULAR! Black does not show well on glass or dark surfaces. Very popular for applying to light colored surfaces. Brown Vinyl Decal Material: When possible go with the gold, as it looks much nicer and stands out better on glass. Gold Vinyl Decal Material: Quite Popular. Has a nice reflective glow when the sun hits it. Looks great on tinted windows or dark surfaces. Works well with many colors. 2-4 year outdoor durability. Silver Vinyl Decal Material: 2nd most POPULAR color! Has a nice reflective glow when the sun hits it. Looks great on tinted windows or dark surfaces. Works well with many colors. 2-4 year outdoor durability. Purple Vinyl Decal Material: Also known as grape. Dark Green Vinyl Decal Material: There is currently no description for this Dark Green vinyl sticker material. Green Vinyl Decal Material: There is currently no description for this Green vinyl sticker material. Yellow Green Vinyl Decal Material: A very Bright and Awesome Green! Similar to a neon green, almost! Oracal 651 Series 064 Up To 6 Years Outdoor. Very Popular! Real Teal Vinyl Decal Material: An ever so slightly lighter teal than the other teal. Sapphire Blue Vinyl Decal Material: This color is popular but medium blue is brighter an will show up brighter on dark surfaces like glass. Medium Blue Vinyl Decal Material: A bright blue. Baby Blue Vinyl Decal Material: There is currently no description for this Baby Blue vinyl sticker material. Ultra Metallic Silver Vinyl Decal Material: High gloss. Lots of glitter and sparkle. Copper Vinyl Decal Material: Very small metallic flake. Beautiful Copper color. Tomato Red Vinyl Decal Material: Has a slight orange tint. Most people who want a regular bright red color go with the Bright Red which is more popular. Mint Vinyl Decal Material: There is currently no description for this Mint vinyl sticker material. Light Yellow Vinyl Decal Material: There is currently no description for this Light Yellow vinyl sticker material. Ivory Vinyl Decal Material: There is currently no description for this Ivory vinyl sticker material. Lavender Vinyl Decal Material: Also known as light purple. Tangerine Vinyl Decal Material: A tad darker than regular orange. Maroon Vinyl Decal Material: There is currently no description for this Maroon vinyl sticker material. Olympic Blue Vinyl Decal Material: A very vivid blue. Also known as pacific blue or sky blue. Golden Yellow Vinyl Decal Material: Similar to sunflower yellow. Tropical Pink Vinyl Decal Material: A slightly darker pink. Also known as blossom or fuschia. Matte Black Vinyl Decal Material: Flat, no gloss. Avery 700 Calendered Permanent Adhesive Vinyl UP TO 6 years durability outdoor. Conformability: Flat simple curves. Olive Green Vinyl Decal Material: There is currently no description for this Olive Green vinyl sticker material. Buckskin Vinyl Decal Material: Tan beige color, or light brown. Neon Green Vinyl Decal Material: A Very Bright Color! Fluorescent Neon Green. Outdoor durable for up to 1 year. Recommended for short term promos only, does not last as long as regular vinyl colors! Neon Yellow Vinyl Decal Material: A Very Bright Color! Fluorescent Neon Yellow. Outdoor durable for up to 1 year. Recommended for short term promos only, does not last as long as regular vinyl colors! Neon Orange Vinyl Decal Material: A Very Bright Color! Fluorescent Neon Orange. Outdoor durable for up to 1 year. Neon Pink Vinyl Decal Material: A Very Bright Color! Fluorescent Pink Orange. Outdoor durable for up to 1 year. Recommended for short term promos only, does not last as long as regular vinyl colors! Frosted Glass Pink Vinyl Decal Material: This vinyl gives an etched glass look with a hint of pink. The vinyl is very transparent. Up to 7 years outdoor durable. Teal Vinyl Decal Material: Just a tiny bit darker than the Real Teal. Sunflower Yellow Vinyl Decal Material: There is currently no description for this Sunflower Yellow vinyl sticker material. Dark Grey Vinyl Decal Material: There is currently no description for this Dark Grey vinyl sticker material. Steel Blue Vinyl Decal Material: A very, very dark blue. Also called indigo or dark navy blue. This color will not stand out well applied to dark surfaces. Note: Dark blue has been discontinued and replace with this color which looks much nicer. Carbon Fiber BL Vinyl Decal Material: Outdoor durable for up to 5 years. Excellent carbon fiber look! It is a very dark color. Does not stand out well on glass or tinted windows because it is dark like black. Carbon Fiber SI Vinyl Decal Material: Outdoor durable for up to 5 years. Shows up really well on glass or applied to dark colored surfaces. Brown Ultra Metallic Vinyl Decal Material: ONLY 6 by 14 inches of vinyl left. Soon to be discontinued. High gloss. Lots of glitter and sparkle. Neon Red Vinyl Decal Material: A Very Bright Color! Fluorescent Neon Red. Outdoor durable for up to 1 year. Recommended for short term promos only, does not last as long as regular vinyl colors! Matte White Vinyl Decal Material: Flat, no gloss. Avery 700 Calendered Permanent Adhesive Vinyl UP TO 6 years durability outdoor. Conformability: Flat simple curves. Charcoal Metallic Vinyl Decal Material: High performance 2 mil vinyl. Beautiful, high gloss, outdoor durable up to 5 years. Dark color does not stand out well on glass. Champagne Vinyl Decal Material: High performance 2 mil vinyl. Beautiful, high gloss, outdoor durable up to 5 years. Violet Vinyl Decal Material: Like the purple but slightly lighter. Light Gray Vinyl Decal Material: A very very light gray color. Silver Metallic 951 Vinyl Decal Material: High performance 2 mil vinyl. Beautiful, high gloss, metallic, outdoor durable up to 5 years. Lime Tree Vinyl Decal Material: Oracal 651 Series 063 Intermediate Lime Tree Green Up To 6 Year Outdoor. This color has an ever so slight olive shade to it. Azure Blue Metallic Vinyl Decal Material: Beautiful High Gloss Oracal Metallic 951 series. Up to 7 years outdoor durability. Durability varies, see FAQ. Coral Vinyl Decal Material: ENDURAGLOSS vinyl. Resembles Peach. *Up to 5 years outdoor durable. Roll size is 12 inches. Metal Metallic 915 Vinyl Decal Material: Slightly darker than the Silver Metallic High Performance. Oracal 951 series 6-year high gloss. Thinner 2-mil vinyl.